HID Global and Sony Corp. announced they have entered into a strategic partnership to develop an embedded contactless smart card reader platform for the global PC marketplace. The platform will be designed specifically for laptop manufacturers and will encompass Sony and HID Global contactless solutions and a range of other deployed technologies while supporting specific regional and application needs. 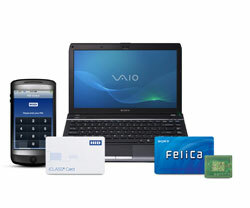 The new embedded reader platform will support Sony’s FeliCa contactless card technology, HID Global’s iCLASS credentials, as well as other adopted technologies. Furthermore, the reader solution will support applications based on Near Field Communication. Goals for the development, including a reference design and comprehensive developer support, are focused on minimizing product development requirements and speeding time-to-market schedules for PC manufacturers. Plans are in place to provide details and availability later this year. Deployed in Asia for more than ten years, Sony’s FeliCa technology is used in approximately 67 million mobile phones in Japan, and more than 315 million FeliCa card chips have been shipped for transportation, electronic money and other applications, worldwide. FeliCa has been the basis for transportation access and merchant communities where customers can easily and rapidly purchase goods and services. HID Global’s iCLASS technology for the jointly developed HID Global and Sony smart card readers will be securely delivered via HID Global’s Trusted Identity Platform (TIP), which enables all end points in a system or network to be validated so that identity transactions between them can be trusted at any time, on demand. HID and Sony are now discussing details of the partnership and finalizing a definitive agreement. With this partnership, HID Global and Sony will further expand their product solutions to increase the benefits and convenience of contactless applications globally.